It seems Motorola (Google) finally realized the initial price of Moto X was not accepted well by consumers, even among long-term Motorola enthusiasts. After 2 months of launching the handset, Motorola halved the price of Moto X to $99.99 (with 2 year contract) quietly. No public announcement. 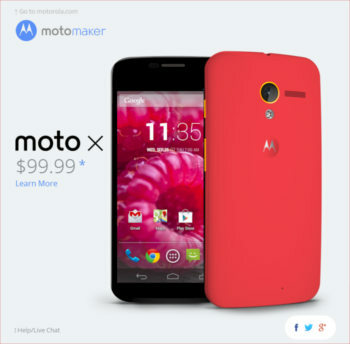 This includes Moto Maker, which allows you to customize your Moto X. Very likely, the contract-free Moto X price will drop within next a few weeks. So, if price pushed you away from getting a Moto X, now it is probably the good time to get your hands on a new Moto X. It is unlikely to see a further price cut for this handset in next a few months. $99.99 is actually the most reasonable price for this handset. Consumers still cares about specs, although user experiences are getting important day by day. No one denies the unparalleled software innovation in Moto X (e.g., touchless control, Motorola Assistant), and most users enjoy them. The recent software update fixed most camera issues. Moto X is arguably the most attractive phone in the market. Technically, the hardware in Moto X is more than sufficient thanks to the optimization of the code and close-to-vanilla-Android implementation. Moto X is actually more snappy than Galaxy S4 and HTC One. However, consumers are still thinking about hardware specs when touching the wallet. They are still unwilling to pay too much premium for optimized software. The mid-range hardware specs spoil the perfect image of Moto X. Most consumers and reviewers were surprised when the price of Moto X was announced in August. This is a lesson Motorola should learn. Consumers are not ready to ignore hardware specs. The price reduction is a correct step to educate consumers what a smartphone should be. Without reaching the hands of consumers, all innovations are wasted, and competitors will close the gap soon. Very likely, Moto Maker will not be exclusive to AT & T after middle or late November. This will remove another barrier between Moto X and its potential buyers. Moto X or HTC One? When I was asked about the “alternatives” for Moto X, the firs one popping out is HTC One. Not just because of the similar screen size. But yes, Moto X and HTC One both have small display (compared with other flagship Android phones from Samsung, Sony and LG). It is 4.7″. Actually the display is not small. Both of them use very thin bezel and therefore, they looks even smaller than their actual size. Just for your information, Moto X has similar front surface area with iPhone 5, but with 20% more display space. Unlike Asian users, most American users still prefer one-handed smartphone, i.e, the phone can be easily operated with one hand. Moto X apparently caters such demand. 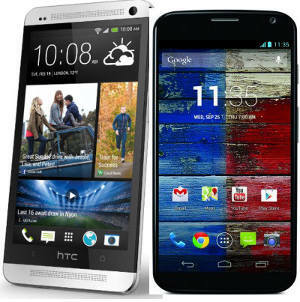 It is not a coincidence that both Moto X and HTC One are in the same size range of iPhone 5. Of course, Android users are spoiled with large display, so 4.7″ screen is a reasonable compromise. Among today’s Android manufactures, HTC is still a leader in hardware design. I’m not talking about market share, for which HTC is plummeting. Maybe HTC will have to leave US market just in 2 to 3 years if the trend cannot be reversed. The design of HTC One seems better than Moto X. The metal body will strengthen your impression when you compare Moto X and HTC One side by side. Moto X actually deviates from Motorola’s old design, especially the robotic Droid design. The exterior design of Moto X is very similar to HTC One: simple and elegant. What drags Moto X down is the plastic feeling. Because Moto X wants to offer customization on the back plate, metal or tempered glass is out of the options. So, from the view point of design and build quality, HTC One is surely better. BTW, “designed, engineered and assembled in the USA” does not help much on design and build quality for Moto X. Both Moto X and HTC One run Android Jelly Bean 4.2. Both will be upgraded to 4.3 in a couple of months.